The Nest Bedding Organic Latex Hybrid delivers adjustable comfort and superior sleep, offering Organic components in your choice of 3 comfort levels. Now with an industry-leading Lifetime Warranty and industry-first Lifetime Comfort Guarantee! Is Organic Latex Hybrid the right bed for you? 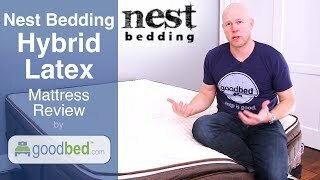 Do you have a Nest Bedding Organic Latex Hybrid mattress? Write a Review! There are no Organic Latex Hybrid reviews on GoodBed yet. Be the first. Have a question about Organic Latex Hybrid products or stores? First Cover Layer Details: 0.25" GOTS Cert. Organic Cotton w/wool batting. Second Cover Layer Details: 1.75" of 1.5 lb Certified Wool Batting. First Comfort Layer Details: 3" of 18ILD-Medium GOLS Cert. Dunlop. Second Comfort Layer Details: 1" of 1.5lb Eco Friendly Comfort Foam. First Support Layer Details: 6" of Caliber Edge Coil Support Pocketed Coils. Second Support Layer Details: 1" of 1.8lb 36ILDGOLS Cert. Latex Base. Mattress Thickness: 13" to 16.50"
Note: The product line specifications above were derived from the active Nest Bedding Organic Latex Hybrid models listed on GoodBed. As a result, these details may not be comprehensive and may not apply to all Nest Bedding Organic Latex Hybrid models. If you are seeking specifications for a particular Nest Bedding Organic Latex Hybrid mattress, please search for that mattress by name on GoodBed, or check with your local Nest Bedding Organic Latex Hybrid dealer. The Organic Latex Hybrid mattress collection is a collection of innerspring mattresses released in 2018 that is manufactured by Nest Bedding. Have an update or correction to our information about Nest Bedding Organic Latex Hybrid? If so, please take a moment to suggest an edit. Nest Bedding Organic Latex Hybrid mattresses sold by Nest Bedding come with a 100-night in-home trial. Nest Bedding Organic Latex Hybrid mattresses are only available online or through Nest Bedding stores. Click here to check for a location near you.